So...it's been a strange summer, and we're sorry for the silence! Due to things beyond our control, we found that our original venue would no longer be available to us for the times we needed it. We began hunting and subsequently found that REST Fest is on what looks to be one of the busiest weeks in Greenville this Autumn! Thankfully, we've just secured a venue that's just as fabulously located and completely ours for the time we need it. It even has a deck! 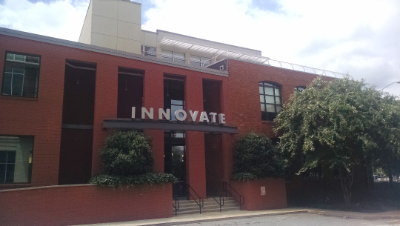 The Innovate Building is located right near the entrance of the Reedy River Falls park and Greenville's fantabulous suspension bridge. If you've been here before, you'll know that intersection well. 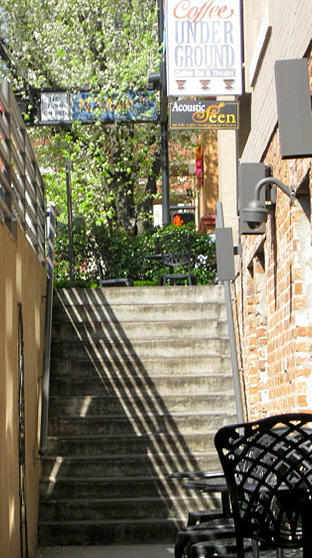 We'll be in easy walking distance of great food and drinks, lots of downtown excitement (it's a busy week remember), and a waterfall just a walk away. On Friday morning, we're going to shake things up a bit! Our Stack Day presentations have a mood all their own, so this year we're moving things to Coffee Underground's Theatre space. We'll be serving a full on custom omelette and pancake breakfast (plus coffee...obviously). There'll be a bit of space for some breakouts, and a stage for those of you willing to present a deep dive through your front-to-back REST stack! We'll then be back to The Innovate Building for the rest of Fridays "main" presentation sessions, James' fabulous keynote that evening, and again on Satruday for the full day of fast and furious five and fives. We're excited about these new spots and are looking forward to sharing more of Greenville's downtown with all of you in under 5 weeks time! RESTFest 2015 is September 17-19! it's that time of year again! RESTFest, one of my favorite geek events of the year, will be happening (once again) in beautiful Greenville, SC. The dates of the event this year are Sep 17-19 and there are still tickets available. And this year's event is shaping up to be another great combo of hacking, demos, lighting talks and socializing. You see what last year was like by checking out the 2015 promo video. we're proud to announce that this year's keynote speaker is James Snell. i've known James for several years. he's a prolific man and has been involved in editing/authoring several IETF standards including the Atom Syndication format, the HTTP PATCH method, and the WC3's Activity Streams spec. his keynote,Practical Semantics, is bound to be excellent. if you show up, you're delivering a talk! our first principle is "everyone talks and everybody listens." for the past five years, we've stuck to a single track event and that allows everyone to hear *all* the talks, too. we all get to interact and experience the event in the same real-time space. theories, formal papers, etc. etc. are all good, but we don't need them at RESTFest. we just want to hear what's on your mind, what you're working on, and what you are interested in talking about. show us your code! day one is "hack day" and each year has a unique theme. anyone can propose a hackday theme and we encourage attendees to submit ideas and come prepared to code in whatever format, style, and framework they love. you can track and contribute to the hackday theme on the wiki. our Code of Conduct is very simple and very clear. essentially -- "Don't be a Jerk." it is critical that RESTFest be a safe, inviting, and positive experience for everyone. you're free to speak your mind as long as your respectful. if this sounds like something you'd enjoy, you're the right person for RESTFest. actually, RESTFest has already started! right now you can sign up at the wiki, add your people page and introduce yourself to the group. you can keep up on breaking news on our email list and secure your place at the event by purchasing one of the limited tickets for RESTFest 2015. if you're realy itching to get connected, drop into our IRC channel on freenode or link to our Twitter accountand start chatting. it's the people who show up each year that make RESTFest such a great event. each year is different and each year is amazing. check out our video channel to see all the talks from the last few years. spots are limited and we'd love to see you there!